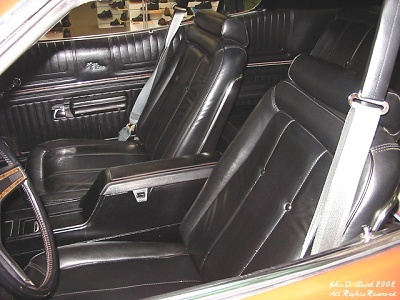 Vinyl bucket seats with center console and floor shifter (automatic) are a very common option in the 1,000 factory S&H units, even though they never used floor shift cars on the TV show. Because they are so well liked, Ertl put them in their 1/18th scale die-cast car in 2002. Because of that, and because of these photos, Warner Brothers put them in their movie in 2003. One of the second - fourth season TV show cars had bucket seats, but they were added after the car was built, so it did not have a floor shifter or center console.